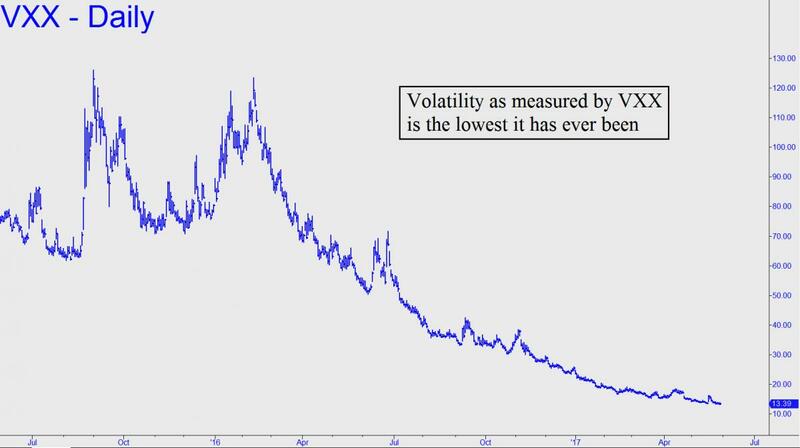 Volatility has gone brain-dead, as today’s chart makes clear. What this implies is that ‘everyone’ has bet the opposite or is hedged up the wazoo with puts, calls or straddles against a stock market melt-up or -down. Such an event is inevitable, but not on any time schedule that traders have been able to predict with any particular success. We’ve got a small bet down ourselves, having hit .666 in our last three at-bats. Two of the trades precisely caught trampoline lows in VXX within hours, allowing subscribers who followed my explicit guidance to easily quadruple their money. Some who held onto a portion of their initial position reported doing far better than quadrupling their stake. Past performance is of course no guarantee of future success, but the current bet, notwithstanding VXX’s relentless sinking spell, is one I can surely live with. See my tout below for explicit details. If you don’t subscribe, click here for a free two-week trial that will allow you not only to view the tout, but to enter the Rick’s Picks chat room, where great traders from around the world gather 24/7.